Would you rather spend $30,000 to replace damaged cylinders, or would you rather repair them with a tool that costs less than $200 and is easy-to-use? If you offered this choice to your customers, what would they say? Would they happily spend thousands of dollars to replace equipment they’d never even used, or would they give your company credit for solving a surface finishing problem in a smart, efficient, cost-effective way? Ask Elmar Industries, a manufacturer from Depew, New York that makes filling machines for sanitary applications. Elmar’s rotary piston equipment is a shining example of precision machining. The company’s 45-station piston filler dispenses a metered quantity of product, and the tolerance between each valve and valve housing must be within 0.001 in. Elmar manufactures filling machinery to the highest quality standards, but equipment suppliers can’t control accidents that happen on a customer’s factory floor. For one of Elmar’s food processing customers, the problem actually started upstairs. The plant was new, and construction continued one floor above a newly-installed filling machine. That’s when concrete and metal shavings fell into a filling bowl and, when the equipment was started, moved to the rotary valves. The damage was so severe that each of the 45 valve plugs had to be replaced. Would the customer need to spend another $30,000 to replace the valve housings, too? “The machine hadn’t even run its first product yet,” explained Thomas Dalquist, special projects manager for Elmar, in a recent article in Hydraulics & Pneumatics magazine. “When you have a capital improvement project, and the customer is looking at an expense bill for replacement parts before production even begins, they wants a quick solution that is cost-effective”. So Dalquist suggested the Flex-Hone® tool from Brush Research Manufacturing (BRM). The BRM Flex-Hone® is a resilient, flexible honing tool that uses a low-pressure, low-temperature abrading process to remove burrs and improve cylinder surface finish. Made with abrasive nylon globules that are permanently laminated to flexible nylon filaments, the Flex-Hone® is self-centering, self-aligning to the bore, and self-compensating for wear. BRM’s flexible cylinder hones require no special training or instruction, and feature a metal stem for mounting the tool in most any rotating spindle. 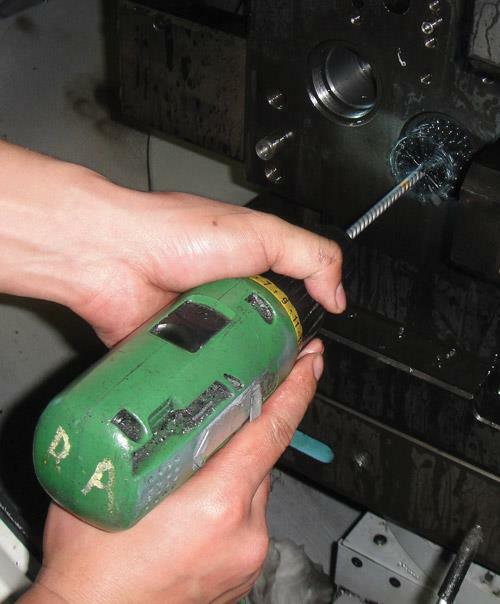 For Elmar Industries, using the Flex-Hone® with a handheld electric drill meant fast, efficient field repairs. Using several 2 1/2” BRM ball hones, Dahlquist honed each of the 45 valve housings to the appropriate specifications. Maintenance took just over 4 hours at a total tool cost of less than $200. “We were able to smooth out all the high points and insert the new valves,” he explained. For the customer, Elmar’s ingenuity meant a savings of $30,000 and allowed the company to start production. Do you have questions about how to select and use the right Flex-Hone® tool for your engine rebuild or new crate engine? Download the Flex-Hone® Resource Guide to learn more.